The meeting finished with a great success! Thanks for your attendance. 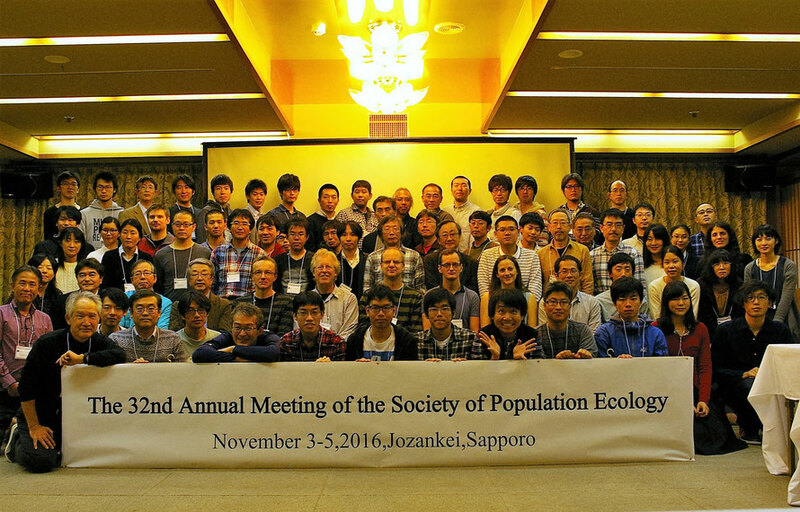 This web site provides information about The 32nd Annual Meeting of the Society of Population Ecology (PES32). The meeting (PES32) will be held in Shikano-yu hotel. This is a ‘lodging-style’ meeting where most participants will stay in the Hotel during the meeting and enjoy discussions in the formal sessions and beyond. The information will be updated regularly. Please, check this site from time to time. Participants will get a printed version of the program at the desk of venue. Click the link to download a registration form (a .doc file). Fill in the form and send it by e-mail to populecol32@fsc.hokudai.ac.jp with the subject ‘Registration for PES32’. You will receive a confirmation e-mail within a week. If you do not receive one, send the registration form again with the subject ‘Registration for PES32 (2nd time)’. Contributed presentations are given only in posters (in Japanese or English). Dues to the limited space for poster boards, the application may close down BEFORE September 15. Be early to secure your poster board! Only the Society members who have paid for the membership for year 2016 are eligible to give a presentation. Co-authors (not the presenter) can be non-members. If you are currently not a Society member and would like to give a presentation, join the Society first. * If you need assistance for joining the Society, contact the Secretariat (populecol32@fsc.hokudai.ac.jp) first. A symposium speaker can give a contributed presentation too. If you are invited to give a presentation in a symposium but not going to join any other sessions in the Meeting, you do not have to register for the Meeting. Check with the organizer of your symposium. The Registration Fee covers lodging for 2 nights and the following 4 meals. Note: Lunches are NOT included in the Registration Fee. The lunch box order and other provision for lunch will be announced later. Make this opportunity to join the Society of Population Ecology. The annual membership is 7,500- JPY for Regular and 2,500- JPY for Student. After you receive a confirmation e-mail of registration, pay for the Registration Fee via bank transfer to either of the following accounts. * If you cannot get assistance from a Japanese friend or colleague, contact the Secretariat (populecol32@fsc.hokudai.ac.jp) for assistance. Make the payment by Friday October 28. If the payment is made after that deadline, be sure to bring the receipt to the Meeting. If the payment is NOT of a regular price above or made for day participation, clearly state the contents in the ‘Note’ of the payment slip. Otherwise, the payment will not be processed appropriately. Type ‘Abstract for PES32’ in the subject and send it to populecol32@fsc.hokudai.ac.jp by Tuesday October 18. Add a circle to the presenter. Prepare an abstract in a Word file (.doc) or a text file (.txt). Name the file with the presenter’s name. The title, the presenter name(s) (affiliation(s)) and the abstract should all fit within 250 words. Do not use any special character or symbol or those specific to font types or OS. If any word such as a scientific name should be typed in italics, use <i> </i> to indicate it, e.g., <i>Rana pirica</i>. You can display your poster from 15:00 on 3rd November (Thu) to 19:00 on 4th November (Sat). Each poster must be displayed on the assigned poster board. Please check your poster presentation ID number. Each poster must be contained within the 90 cm wide by 182 cm high space provided. Push pins are provided by the committee. Poster presentation time: 19:00 – 21:00 on 3rd November (Thu), and 15:00 – 16:00PM on 4th November (Fri). The society of Population Ecology will award young researchers presenting excellent posters. Graduate students and researchers who received his/her Ph.D. degree within 2 years are eligible for the competition. Entrants for poster awards are indicated on the poster board. All the regular participants are cordially invited to vote for the poster award. You will receive one voting sheet at the meeting reception. Please choose one excellent poster and write the poster presentation ID number on the voting sheet. Voting box will be found on the 3rd floor around poster presentation space. Vote by 16:00 on 4th November (Fri). 1 Best poster and about 3 excellent posters will be awarded based on the voting by the regular participants. The winners will be awarded in the banquet. Since its establishment in 1961, the Society of Population Ecology has been a gateway to success for a number of ecologists. It is no doubt that the driving force has been presentation opportunities and frank and unrestricted discussions in annual meetings. This year we organize an oral presentation session by young ecologists. Each presenter will take an advantage of a 30-minute slot to publicize their research activities, and the audience are invited to join the discussions. It is the first lodging-style meeting after 9 years (the last one in 2007, also in Jozankei). Let’s make the most of this mingling (and no-curfew) style to enjoy discussions over the presentations in this session and empower young researchers who bear the future of the study of population ecology. Call for speakers: Young enthusiastic ecologists wanted! We are calling for some 5 young researchers to give presentations (‘young’ by your own definition). This is an excellent promotional opportunity for those who would like to give a big boost to their research recognition or are eager to discuss their research prospects and receive feedback and constructive criticism. Why not apply for it? Send an e-mail to populecol32@fsc.hokudai.ac.jp with the subject ‘Application for Young Ecologists Session in PES32’. You will receive a confirmation e-mail within a week. If you do not receive one, send the registration form again with the subject ‘Application for Young Ecologists Session in PES32 (2nd time)’. If there are many applicants, the application may close down BEFORE September 8. Be early to send your application! There is no limit to the entry to this session. You may make an application to this session as well as the Contributed Presentations (Poster) and/or a Symposium. A presentation can be given in Japanese or English. However, the presentation slides (e.g., a PowerPoint file) must be prepared in English.